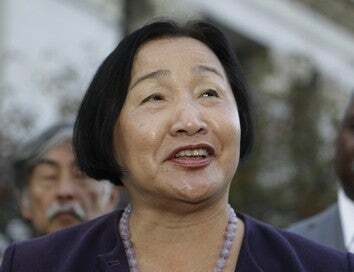 Election officials say Jean Quan will become Oakland's first female mayor, and the first Asian-American woman to be mayor of a major U.S. city. The format of her election was a first as well. Quan, a current City Councilwoman and former school board member, was far from the favorite. According to the AP, she didn't capture endorsements by either major newspaper serving Oakland. And when votes were first counted last week, her opponent Don Perata had a double-digit lead. But this year, Oakland instituted ranked-choice voting, meaning citizens could vote for their second and third as well as their first choice for mayor. Perata got more first-choice votes, but when third-place candidate Rebecca Kaplan was eliminated, Quan's second-choice votes pushed her over the top. Every day I was in house meetings, booked solid from morning until 10 o'clock at night, and wherever I was, Jean was there, too. She hustles. If you contrast that with Don, it's not a criticism of him, it's a reality. He consciously avoided participating in lots of events. It's a travesty that a candidate that wins 78 percent of the precincts and leads by more than 11,000 votes (after first-choice votes are counted), with a margin of nearly 10 percent, loses the election. In any other contest it would be a landslide win, not an election loss. Ranked-choice voting is an injustice, and Oakland will pay the price. With all of this, Mayor-Elect Quan must be sure to realize that she does not have a mandate; she did not score the majority of popular votes. That should be of concern to her. The Mayor-Elect must — and I think will — be open to people. Moreover, Jean must — and this can't be overstated — develop a very thick skin. She must work to jettison the idea that people who criticize her aren't in her corner. Not so. She's Mayor of Oakland, now, and that means she's got a PR-issue to deal with every day. All that aside, this is the first time any journalist has been able to use the phrase "she's Mayor of Oakland" — and that alone is something for Quan to be proud of.